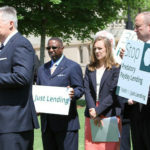 WASHINGTON—Consumer advocates and predatory lending opponents expressed alarm about a proposed rollback of regulation designed to protect vulnerable borrowers from escalating debt. The proposed change would eliminate regulation requiring lenders to determine borrowers’ ability to repay their loans before issuing them. The rule was proposed in 2016 and finalized in November 2017 but never implemented by the current administration. The proposal to rescind the rule is open to public comment for 90 days. Kathy Kraninger, director of the Consumer Financial Protection Bureau, announced the proposed rule change Feb. 6, saying it would encourage competition in lending and improve borrowers’ credit options. However, groups opposed to what they call predatory lending insisted the rollback would remove important protection for vulnerable borrowers. “I am extremely disappointed by the decision of Director Kraninger to gut the payday rule. It offered important protections for low-income and impoverished Texans, and this decision is an unnecessary setback,” said Kathryn Freeman, public policy director for the Texas Baptist Christian Life Commission. “Removing protections essentially benefits predatory lenders but leaves average Americans in the dust,” a statement issued by the alliance read. The group noted average annual percentage rates on payday and auto title loans in Texas range from 200 percent to 500 percent. “Texas stands out as having some of the highest rates and worst protections for payday and auto title loans in the country,” the alliance said, noting Texans paid $9.2 billion in fees on those type of loans from 2012 to 2017. Richard Cordray, former director of the Consumer Financial Protection Bureau, criticized the proposed rule reversal on Twitter.